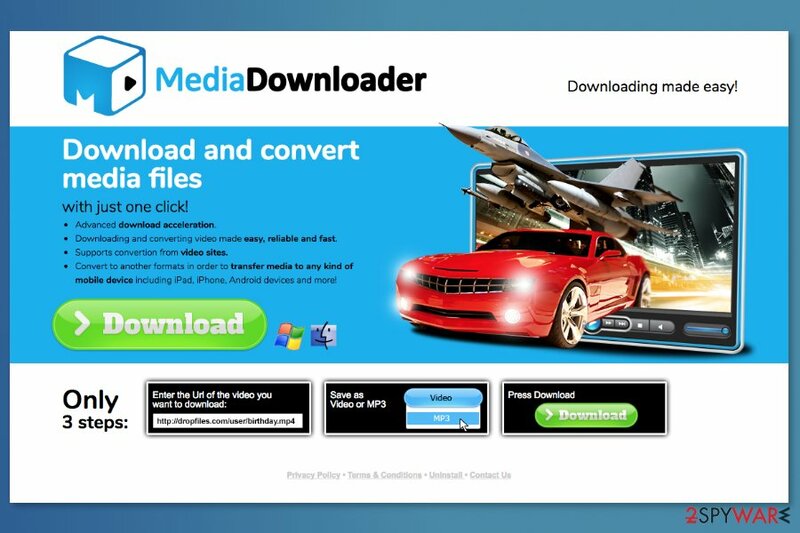 Media Downloader is the PUP that uses misleading techniques to prevent removal. Use Reimage to locate malicious components and get rid of them faster than with uninstall instructions. A full system scan blocks virus reappearance and prevents traffic to malicious domains. 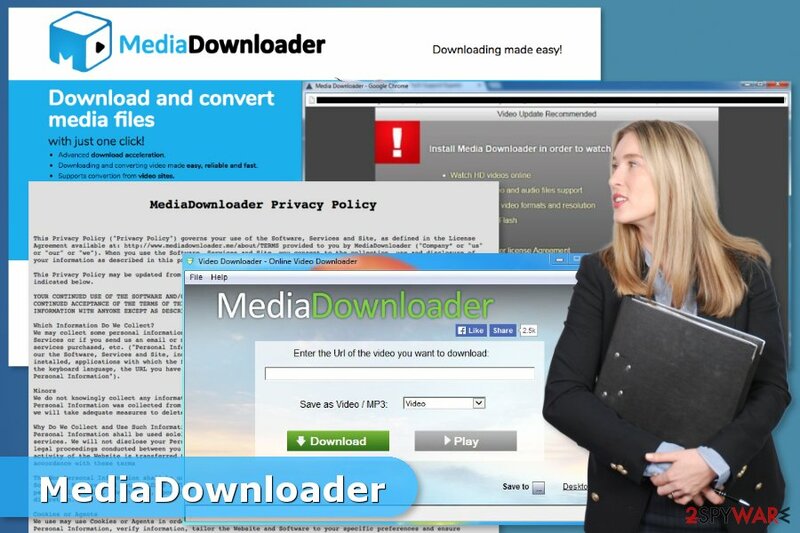 After the infiltration, Media Downloader virus employs virtual layer that allows placing third-party commercial content on each website that user enter. These ads might look legit especially if they are displayed on your favorite site. However, they might be placed on strange parts of the website and cover necessary content. The majority of ads offer updates from suspicious sources, such as related-offers.com. According to its victims, this PUP causes “A new Media Downloader version is available,” “Do you want to update MediaDownloader?”, and similar ads that can redirect to third-party websites promoting questionable software. However, security experts recommend staying away from ads because they might redirect to third-party websites promoting questionable software. However, these “updates” night be obfuscated potentially unwanted programs or even malware. As you can see, MediaDownloader works as an adware, or ad-supported, program. Therefore, it is designed to generate revenue for its developers. Unfortunately, they do not pay much of the attention to the affiliates credibility. However, advertising issues are not the only problem. Some of these apps are known as potentially unwanted programs that might affect all web browsers, so you can notice its ads on Safari, Google Chrome, Mozilla Firefox, Internet Explorer, Microsoft Edge and other browsers. If you have been suffering from them, you can remove Media Downloader with Reimage. The main issue is that developers have a right to share aggregated non-personal information with “third parties, including, advertisers, sponsors, business partners, investors, affiliates, and consultants.” Thus, your browser might crash from commercial content due to an increased amount of suspicious shopping offers. That’s why you should consider Media Downloader removal. After the installation of Media Downloader, you might find numerous unknown add-ons and extensions in your browser. Even though users can download it voluntarily, most of the time it sneaks inside the system unnoticed. Usually, it comes to the system bundled with other installers that are promoted on third-party download websites, such as Ez Software Updater and other. Beware that even the most reliable sources can promote software with additional components, so you must double check it before installation. To avoid such cyber threats in the future, experts from Finland suggest checking the trustworthiness of the freeware by reading users' reports and other information. After that, you have to select Advanced or Custom installation option and monitor the entire process carefully. Make sure you look for various add-ons, plug-ins, toolbars, and extensions that are promoted as useful tools and opt out of them without any hesitation. For a full Media Downloader removal, we recommend using two different methods. You can either run a full system scan with a reputable anti-spyware and get rid of this downloader automatically or follow manual removal guidelines. These guidelines were prepared by our experts who are seeking to help people with their computer-related issues. However, you must be very attentive while using them to prevent unexpected problems on your computer. Besides, you should not only remove MediaDownloader from the computer but other entries that were included in the bundle with a program. As we have mentioned in the beginning, this PUP spreads together with a bunch of suspicious apps that should not be left on your device too. To uninstall MediaDownloader from Windows operating system, you need to get rid of every component which is related to this adware. These programs have been noticed to be related to this adware: Media Downloader version 1.5, VideoDownloader, Ez Software Updater, MPlayerX, NicePlayer, MyShopMate. Here, look for Media Downloader or any other recently installed suspicious programs. Apple users are the main victims of the virus. To get rid of it and prevent its reappearance in the future, make sure that you remove all components of this adware. In this case, you should find Media Downloader version 1.5, Ez Software Updater, MyShopMate, VideoDownloader, MPlayerX, NicePlayer and similar entries. Wait until you see Applications folder and look for Media Downloader or any other suspicious programs on it. Now right click on every of such entries and select Move to Trash. We highly recommend resetting Internet Explorer to quickly remove suspicious add-ons that may have been installed with MediaDownloader. When in the new window, check Delete personal settings and select Reset again to complete Media Downloader removal. Once these steps are finished, Media Downloader should be removed from your Microsoft Edge browser. Open Firefox extensions and remove Conduit toolbar, Babylon toolbar or other suspicious add-ons. Here, select Media Downloader and other questionable plugins. Click Remove to delete these entries. Now you will see Reset Firefox to its default state message with Reset Firefox button. Click this button for several times and complete Media Downloader removal. Follow these steps to wipe out suspicious toolbar and extensions that may have arrived together with the software. Here, select Media Downloader and other malicious plugins and select trash icon to delete these entries. Click Reset to confirm this action and complete Media Downloader removal. Here, select Extensions and look for Media Downloader or other suspicious entries. Click on the Uninstall button to get rid each of them. Now you will see a detailed dialog window filled with reset options. All of those options are usually checked, but you can specify which of them you want to reset. Click the Reset button to complete Media Downloader removal process. ^ Do Apple Macs get viruses?. Computer Hope. The website about computers and their problems. ^ Adware. Trend Micro. Enterprise cyber security solutions. ^ Definition of: ad-supported software. PCMag. Technology product reviews, news, prices and downloads. ^ Virukset. Virukset. Finnish cyber security, spyware and malware news. This entry was posted on 2017-10-19 at 08:35 and is filed under Adware, Viruses. You can quickly scan the QR code with your mobile device and have Media Downloader adware manual removal instructions right in your pocket. How did you remove Media Downloader adware?